MILAN (Reuters) - Concerns about the potential size of fines facing Fiat Chrysler Automobiles following U.S. accusations of misleading regulators on diesel car emissions is likely to put off investors until the matter is settled, analysts said on Friday. Its share price tumbled 16 percent on Thursday after the U.S. Environmental Protection Agency's (EPA) accused the company of using hidden software to allow excessive diesel emissions to go undetected, leaving FCA facing a maximum fine of about $4.6 billion. The stock recovered some ground on Friday, rising 4.4 percent to 9.185 euros but remained well below levels it hit before the EPA announcement on Thursday, when the stock was a notch short of setting a fresh record high after rising to levels it last touched in March 2015. Larger rival Volkswagen (VOWG_p.DE) has admitted to cheating diesel emissions tests and agreed to spend up to $22 billion in the United States to address claims from owners, environmental regulators, U.S. states and dealers. FCA, which sits on net debt of 6.5 billion euros ($6.89 billion), lacks VW's cash pile but analysts said its case looked much less severe than that of its German counterpart. The EPA said FCA failed to disclose engine management software in 104,000 U.S. vehicles leading to an increase in emissions of nitrogen oxides (NOx). However, the authority has not yet labeled them "defeat devices" as in Volkswagen's case. FCA Chief Executive Sergio Marchionne angrily rejected the allegations, saying there was no wrongdoing and FCA never sought to create software to cheat emissions rules. He also stressed FCA's situation cannot be compared with VW's. Analysts drew best and worst case scenarios, estimating potential fines ranging from several hundred million dollars to $4 billion. But they said the likelihood of hefty fines was low. "Our base case is that the current violation notice is settled as a reporting violation of $140 million, a very manageable figure for FCA," said Stuart Pearson, an analyst at Exane BNP Paribas. "However, until the issue is settled, emissions uncertainty is likely to remain a significant overhang to the shares and break the stock's impressive recovery since Trump's election." Before Thursday's tumble FCA's shares had risen by around 70 percent since Donald Trump's election, on expectations of less rigid emissions rules under the next U.S. administration. Analysts also noted that FCA's vehicles are already equipped with selective catalytic reduction (SCR) systems for cutting nitrogen oxide emissions, so it is likely that any problem could be fixed at a relatively immaterial cost. 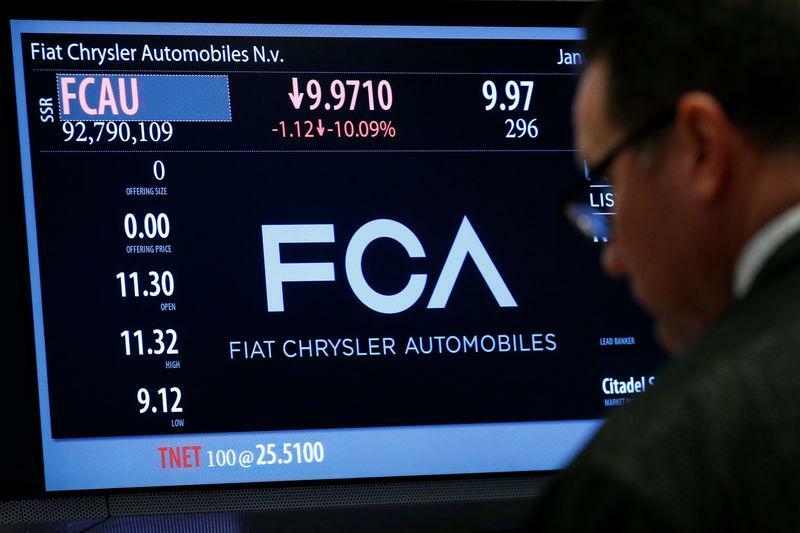 Widely credited with rescuing Chrysler from bankruptcy and a major U.S. employer, FCA may also have some trump cards up its sleeves in any upcoming negotiations, analysts said. The group has just pledged to invest $1 billion to modernize two plants in the U.S. Midwest and create 2,000 jobs - a move openly applauded by Trump - and those investments could be at risk if it is asked to pay any substantial amounts. Nevertheless investors remain concerned what the threat of fines will mean for FCA's 2018 targets, including its promise to erase all debt, and the impact the announcement will have on the Jeep brand, the cornerstone of the carmaker's turnaround plan. Italian media on Friday quoted Marchionne as saying the EPA enquiry would not affect those goals. FCA may sell assets - like components maker Magneti Marelli - to raise cash, analysts said, but its outlook remains clouded. Credit ratings agency Fitch said on Friday the EPA accusations could pressure FCA's rating, while a consumer group in Italy already asked prosecutors to check whether the engines mentioned in the U.S. report were also in circulation in Italy. "It's difficult to consider the recent correction a buying opportunity," said Michele Pedroni, fund manager at SYZ Asset Management in Geneva. "The valuations remain attractive, but the positive catalysts are known and risks have increased. "On top of that, Fiat has one of the most leveraged balance sheets in the industry, making it more fragile when facing any 'issue' that could further worsen its capital position," he said.